Berry pie is a summer tradition and has to be made at least once during berry season. It’s coming to the end of summer but beautiful berries are still at the farmers market. If you use ripe organic or homegrown berries, cut the sugar to one cup or less. Some sugar is needed however, to create a syrupy sauce. This pie is also pretty tasty for breakfast with yogurt or kefir. Remove the dough from the fridge and allow the disc to set on the counter for 10 minutes. 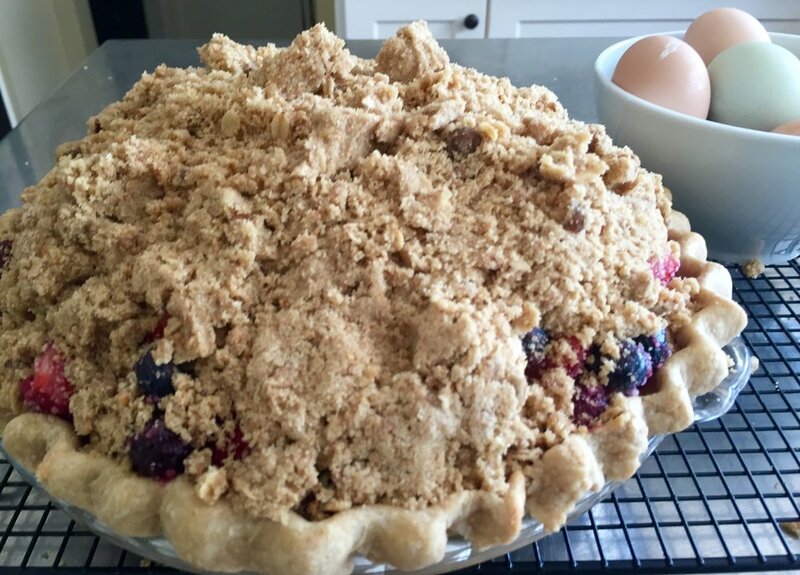 Make either crumble by blending all of the dry ingredients using whichever recipe you choose, streusel or granola. Add the melted butter or oil and blend to combine. Set aside. Roll out dough on lightly floured surface to a 15-inch round. Transfer the dough to a 9-inch-diameter pie dish. Trim the dough overhang to one inch. Fold the overhang underneath itself and crimp decoratively, forming a high-standing rim. In a bowl large enough for the fruit, mix berry filling ingredients and set aside. Remove crust from the freezer and spoon the filling into crust. Using your hands, sprinkle the topping over the fruit. Squeeze some of the topping in your hands to create different sizes of “clumps”, large, medium and small. Crumble topping evenly over filling. Bake until the filling is bubbling and clear rather than opaque and the topping is golden brown, about 45 to 55 minutes. Cover loosely with a sheet of foil if topping browns too quickly. Transfer pie to rack and cool for at least 3 hours. Makes one 9-inch pie. Double the recipe for a two crust pie. In a small bowl, mix the water and vinegar which helps to keep the gluten from developing and makes a tender crust. Mix one cup of the flour, salt and sugar, if using, together lightly in a mixing bowl or in the bowl of a food processor. Add the lard in chunks and cut into the flour using a pastry cutter or by pulsing the food processor. The mixture should look like large crumbs and begin to cling together in clumps. Add the remaining ½ cup of flour and mix lightly or pulse the processor two or three times. Do not over mix this flour. At this point if using a food processor, remove the flour/fat mixture to a medium bowl. Sprinkle the water over the dough and with hands or a wooden spoon, mix the dough just until the dough holds together. Loosley form it into a disk, wrap in wax paper, and chill for one hour or more. You can also use all butter or half butter and half lard which makes a sturdier dough for things like slab pies, tarts or hand pies.